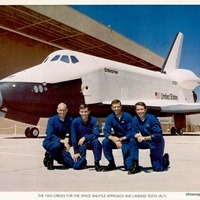 The first two crews for the Space Shuttle Enterprise during the Approach and Landing Tests. Photographed, from left to right, are Crew 1 Pilot C. Gordon Fullerton (1946-2013), Crew 1 Mission Commander Fred Haise (1933-), Crew 2 Mission Commander Joe Engle (1932-), and Crew 2 Pilot Richard H. Truly (1937-). Rockwell International built the Space Shuttle Fleet in Palmdale, California. Enterprise was not used for space flight, but rather for a series of landing tests after being flown to altitude on the back of a Boeing 747 jet. The Space Shuttle was meant as a reusable alternative to the traditional ballistic rockets used to launch manned spacecraft in the 1960s and 1970s. From 1981 to 2011, when the fleet was retired, five shuttles were flown over 130 times. It was the first space launch system that was mostly reusable, as the shuttles themselves and the solid rocket boosters were reused multiple times. Space shuttles were launched from Launch Complex 39A (LC-39A) and Launch Complex 39B (LC-39B) at John F. Kennedy Space Center (KSC) in Merritt Island, Florida. "Enterprise(OV-101)." Kennedy Space Center, National Aeronautics and Space Administration. Accessed September 9, 2015. http://science.ksc.nasa.gov/shuttle/resources/orbiters/enterprise.htm. 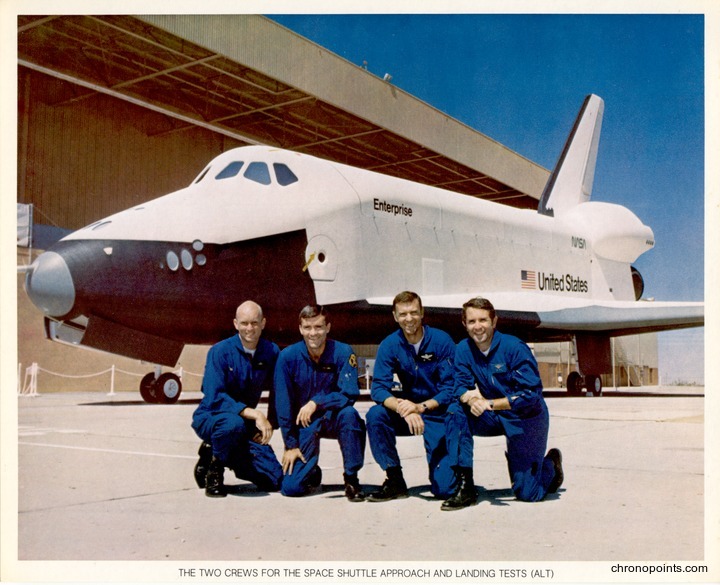 “Crew 1 and Crew 2 with Space Shuttle Enterprise .” RICHES of Central Florida accessed April 24, 2019, https://richesmi.cah.ucf.edu/omeka/items/show/6124.